I continue my project to transcribe family letters, journals, audiotapes, and other historical artifacts. Not only do the documents contain genealogical information, the words breathe life into kin - some I never met - others I see a time in their life before I knew them. 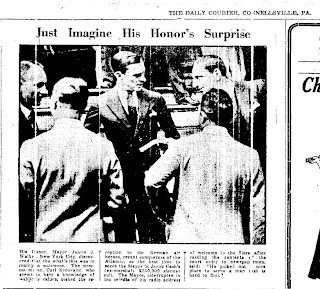 This week I transcribe a couple 1930 news stories involving a distant cousin who managed to get his photograph in the newspaper, handing a summons to the mayor of New York City. New York. Aug. 29—(UP)—Carl Kroovand, the process server who interrupted Mayor. James J. Walker's address of welcome to the German fliers is sorry he selected that particular moment to serve the summons but "business Is business." 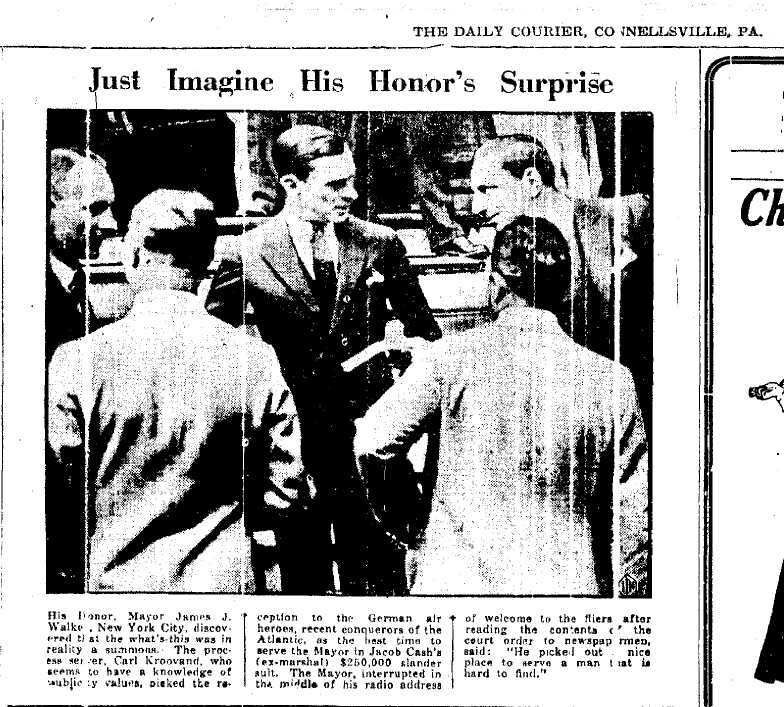 He strolled through a police line at city hall yesterday just as the mayor was stepping up to the microphone to make a speech for the benefit of Wolfgang von Gronau and the three other men who made the transatlantic flight. Walker was astounded as Kroovand slipped a paper into his hand which informed the mayor that one Jacob Cash was suing him for $250,000 charging slander. "It was an Insult to the" people of New York, the people of the United States and the people of Germany." Walker said after completing his speech. “The bigger they are, the harder they fall,” declared Kroovand. 3) Carl Kroovand (1899-1960) was the second cousin of my paternal grandfather. 4) This is my 100th Amanuensis Monday transcription. I believe in 2011 I may begin including some transcriptions that don't directly mention kin, but are of interest historically, either in the Greater St. Louis area, or in other ancestral locations. I also have a couple more audio tapes I still wish to transcribe - one of which excerpts from may appear here. Congratulations on your 100th transcription. Thanks for hosting this meme every week. I appreciate it.